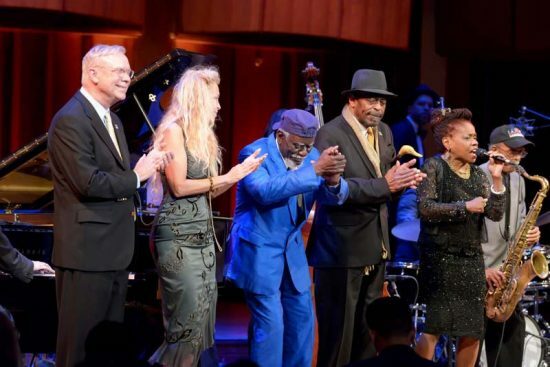 2016 NEA Jazz Masters Gary Burton, Wendy Oxenhorn, Pharoah Sanders and Archie Shepp (from left), with Catherine Russell and saxophonist Jimmy Heath, at the Kennedy Center in April. The National Endowment for the Arts will honor this year’s Jazz Masters—Bob Dorough, Abdullah Ibrahim, Maria Schneider, and Stanley Crouch—with a series of Washington D.C.-based events in mid-April, including an NPR-hosted listening party and a student master class. On April 15, a tribute concert will be held at the Kennedy Center, featuring performances by Jay Anderson, Steve Berger, Terence Blanchard, Terri Lyne Carrington, Kurt Elling, Sheila Jordan, Bill Goodwin, Cleave Guyton, Grace Kelly, Frank Kimbrough, Noah Jackson, Christian McBride, Charles McPherson, David Murray, Pat O’Leary, and Scott Robinson. Ibrahim and Schneider will speak at the event. Patrick C. Dorian, distinguished professor emeritus of music at East Stroudsburg University of Pennsylvania, will stand in for Bob Dorough, who died last year, and Loren Schoenberg, senior scholar with the National Jazz Museum in Harlem, will represent Stanley Crouch, who will be unable to attend the concert because of an illness. Jason Moran, the Kennedy Center’s artistic director for jazz, will host the concert, which will be streamed lived here. For more information and to reserve tickets, go here.